All food processing companies aim to optimise every operation in the factory. Here, Norbert Brunnquell, senior product manager slicing & loading from GEA, looks at the factors that contribute to designing an efficient slicing line, suggests the key considerations for manufacturers when they select slicing technology, and touches upon the trends in the industry that move the minds of R&D engineers. Slicing is a typical and necessary process for food processing companies. 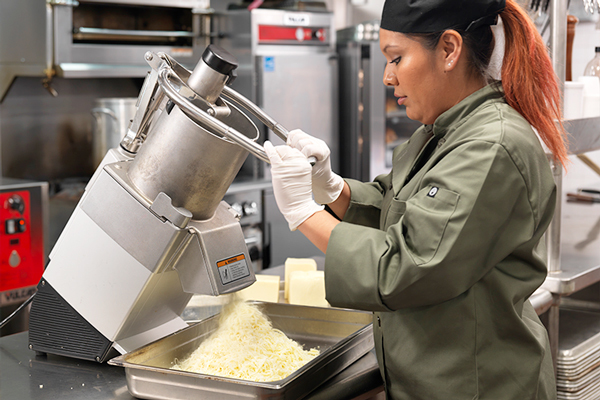 In a world where efficiency of operations takes priority, food processors can benefit with efficient lines. A hygienic environment is essential to maintain product quality and the longest possible shelf-life. The appropriate environment is achieved through an optimised clean room concept. The clean room will have a continuous overpressure of clean air, hygienic locks, restricted personnel access and a controlled temperature. There should also be a clear, fixed cleaning procedure for the whole cleanroom area. There are two main concepts of slicing line arrangements within the clean room: either all lines located in one room or—as a conceptual trend—individual line cells with one or maximum two lines each. This allows a cell to be shut down while its two lines are cleaned and other cells continue normal production. 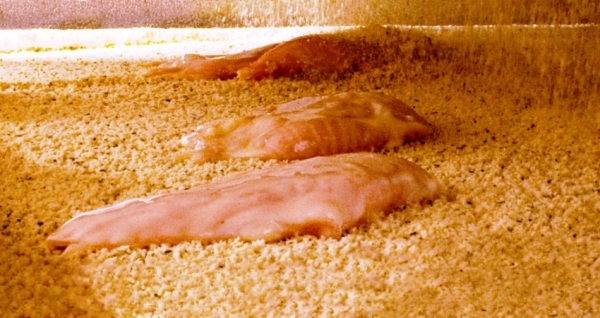 It’s vitally important to have a clear product flow into the clean area to avoid any cross-contamination. Only those members of staff who need to be in the clean room should have access. The number of people will be determined by the level of automation employed: a highly automated slicing line may dramatically reduce the required number of operators. Slicing equipment is set up for optimum performance on a specific product. It is essential, therefore, that the product remains consistent to maintain high-level production over an extended period. Variations in the quality of raw materials, ingredients, manufacturing process and temperature of the product will all affect the outcome. By choosing the correct slicer and setting the line up carefully to match the product, it is possible to achieve a very low give-away and high yield with consistent product quality from a continuous slicing, loading and packaging process. 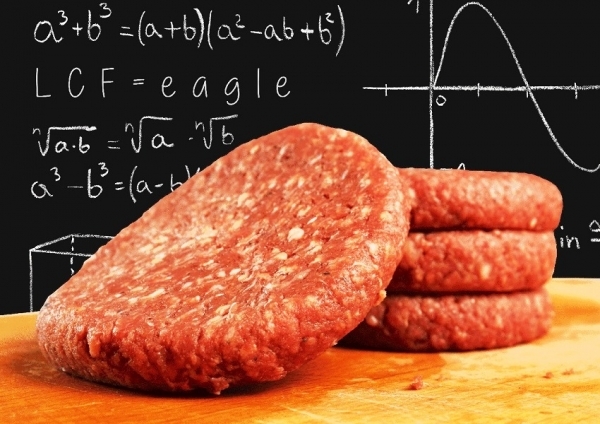 After cooking, all meat and sausage products require a period of storage to allow the proteins to connect properly and create a product that is sufficiently stable to be sliced. If the storage time is too short, the product will not be sufficiently stable for efficient slicing. It is essential that the optimum storage period is maintained to retain product quality. Temperature has a big impact on the stability of the product and on its shelf-life. It is quite common, especially in emerging markets, for the storage and slicing temperatures to be too high for optimum product stability to be achieved. The ideal temperature for slicing is 0-2 deg C. Products should be stored at a temperature that allows this temperature to be achieved before the product enters the slicer. Although modern equipment, for example, using circular and involute blade machines, allows the slicing process to be adapted to compensate for the variation of product properties, it is not able to operate at an optimum level if the product temperature is too high. In this case, the slicing accuracy will be affected. The level of operator training can have a significant effect on the production efficiency, the condition of the machines, and their total cost of ownership. A well-trained line operator will have the authority to create and store recipes and set up the line. A good machine operator will understand the process and, if slicing accuracy deteriorates, will know what action to take: perhaps the blade needs to be reground or the machine setup (correctly installed grippers, top traction and shear-edge) checked. The shear-edge distance has an important impact in slicing quality. Therefore, the most advanced slicers have very stable blades and—in case of involute blade machines—an automatic shear edge gap adjustment. Correct training will also help the operator identify the source of error messages, such as a film or label roll that needs to be replaced, and take corrective action quickly and accurately. This helps to maintain overall line efficiency. Cleaning staff need to be able to prepare the machines for cleaning, clean them using the correct detergents and pressures, and reassemble the machines quickly, safely, and without causing damage that could affect their operational lives. Although staff should be trained initially by the supplier when the line is commissioned, manufacturers need to ensure that ongoing training is available for new members of staff as required. 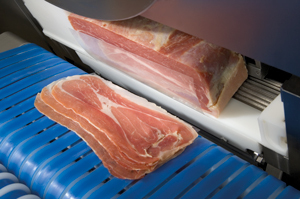 Most food manufacturers have a clear idea of the type of slicing line they want. They need a system that’s easy to operate, provides the best hygienic execution (e.g. easy access for cleaning sloping surfaces, no corners where dirt can collect, product-related parts that can be removed without tools), has simple controls that allow recipes to be changed at the click of a button, clearly displayed errors, and useful machine data that records production uptime and the reasons for interruptions in production. The footprint of slicing systems varies considerably depending on the level of performance, line functionality and automation required. It is impractical to do a proper line concept if the required space is not available. In this case, a greater level of manual operation might be required. The supplier needs to know this key dimension right from the start. Suppliers need to know the required capacity of the line in kg/hour or tons/shift. This will clearly show the supplier the type of slicer required, the best loading system and the concept of packaging equipment necessary to meet this most basic requirement. 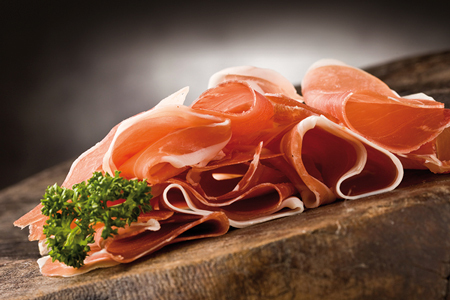 Different products require different slicing techniques so suppliers need to know the type and range of products to be sliced, the maximum and minimum product length, the product dimensions, and portion types, weight and the number of slices in each pack. This information is essential to make a proper calculation of the type of line required and to begin putting together a line concept. Obviously, many manufacturers are focused on the quality of their product. However, there are a range of options for the slicing and packaging of the products, and these also need to be considered. If manufacturers identify these requirements at an early stage, it will greatly smooth the process of selecting a slicing line that will be appropriate for their current needs and adaptable to potential future requirements. There has been a trend in Europe for some time—that will no doubt spread to Asia—towards greater flexibility, smaller batches and smaller pack sizes. There was a time when slicing lines were made as big as possible to maximise capacity. These machines required a large footprint, were not particularly efficient and were difficult to maintain. Manufacturers are now returning to highly flexible machines with standard dimensions (560 mm wide film with an index length of 600-800 mm), high capacity and smaller footprint. They want a highly efficient, automatic line but one that is appropriate to the packaging of smaller batches and offers a fast changeover to other products. Manufacturers are also requiring a greater degree of process control. Modified atmosphere packaging has been around for some time but the most advanced systems can now both control the residual oxygen levels in packs down to less than 0.1 percent and scan the pack to check the levels, after packing and without damaging the pack, with 100 percent reliability. Control systems can also check the sealing and labelling of each individual pack, identify foreign particles, and reject faulty packages before any additional work, such as final packaging, is carried out. Recipes can be loaded on to machines easily and changed with the press of a button. Manufacturers are increasingly looking to suppliers to provide them with production data via an interface between the slicing line and their back-office systems. Information such as uptime, downtime, stock levels, production levels, blade speeds, etc., all contribute to the knowledge needed to run an efficient plant. These systems also act as an early warning of machine wear that can greatly aid the maintenance program. Concepts Some years ago there was a call for manufacturers to reduce waste packing material. This trend carries on with suppliers continually searching for ways to use less material while still providing the protection required. At the same time, the presentation of the product on retail shelves is still very important, and manufacturers and retailers are keen to ensure that their products appear fresh, innovative and appealing to consumers. There has been, therefore, a recent trend towards more impressive, luxurious, wider packaging, designed to catch customers’ eyes, with lower pack weights, overlap and contour portions, and folded or shaved slices. Smaller portions are also popular, especially in Asia and to meet the needs of single-person households in urban areas. When designing a slicing line, manufacturers need to consider: the hygienic environment, product consistency, storage time, temperature and operator training. They also need to work with their equipment supplier to establish the most appropriate equipment configuration to meet their production targets across the whole line and their requirements for process control and data acquisition. This will help ensure that they have an efficient, productive and sustainable plant. When selecting equipment, manufacturers should consider the space available, the capacity required and, most importantly, whether it can give the supplier a clear overview of the product characteristics and the packaging requirements. 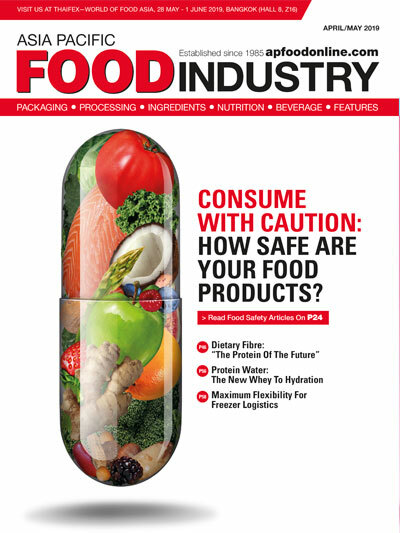 Trends point to the need for greater flexibility, smaller pack sizes or more luxurious presentation, more process control and smart quality assurance, and the ongoing requirement for packaging that attracts the consumer as well as protect the product. 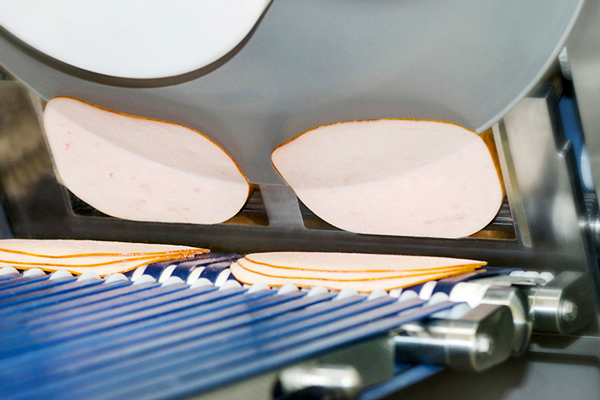 When choosing an equipment supplier for their slicing line, a food manufacturer should also take into consideration the complete offer before and after the slicing process, as well as the ability of the equipment supplier to extend, expand or upgrade the configuration and thus meet the customer’s long-term needs in terms of quality, performance, product safety, efficiency and operation.